OAKLAND, Calif. (AP) Golden State lost its emotional leader when Draymond Green was ejected shortly before halftime. The defending champs were sloppy again, even forgetting several plays after one timeout and still somehow won – but it has hardly been easy so far. Kevin Durant had 31 points, 11 rebounds and six assists to help rally the Warriors from 18 points down and beat the Wizards 120-117 on Friday night, a game marred by a fight between Green and Washington’s Bradley Beal that led to both being tossed. Stephen Curry added 20 points, eight assists and five rebounds, hitting two 3s and two free throws in the final minute of the third quarter to get Golden State within 97-87 heading into the final 12 minutes. Then Klay Thompson and Durant made 3s early in the fourth for a four-point game. Thompson scored 18 points. Durant’s jumper with 1:20 to go put Golden State up by five, but the Warriors still needed his two free throws with 9.4 seconds left. John Wall missed an off-balance 3 then Washington couldn’t capitalize on one final chance. Green had to be pulled away from the skirmish by Andre Iguodala and Warriors security personnel. Green was tossed after getting his second technical foul. The back of his uniform was torn from near his right shoulder down to his waist. 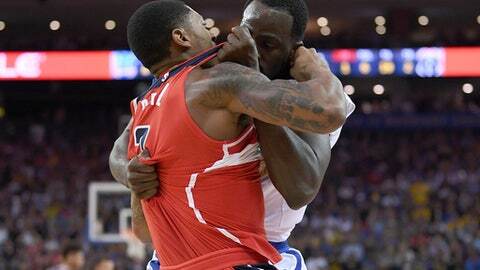 ”I thought Draymond defended himself and bit the bullet of being ejected for the game,” West said. Green was hit with his first technical at the 8:05 mark of the second quarter for arguing an offensive foul call. He had six assists, three points, three rebounds and three blocks before his early exit. The Warriors are still trying to figure things out, having given up 17 offensive rebounds two nights earlier in holding off the Raptors and also committing 17 turnovers – which they did again Friday. Golden State began 1 for 10 from 3-point range while committing seven turnovers and allowing six 3s by early in the second quarter. But the Warriors did enough to win a fourth straight at home against the Wizards. Wall had 20 points and 14 assists for Washington. Kelly Oubre Jr. scored 19 and Marcin Gortat had 18 for the Wizards, whose three-game winning streak to open the season was snapped in embarrassing fashion with a 102-99 overtime loss at the Lakers on Wednesday. The Warriors honored beloved Al Attles, who missed his tribute night because he’s in the hospital. The 80-year-old Attles is in his 58th year with the franchise as a player, coach of the 1975 title team, a GM and now ambassador. Kerr wore an itchy, ”100 percent polyester” retro suit for the occasion, while Warriors players wore shooting shirts featuring his likeness and a bobblehead was the giveaway. His wife, Wilhelmina Attles, son, Alvin Attles III, and Hall of Famer Rick Barry represented him during an on-court tribute after the first quarter. Wizards: Washington shot 15 for 33 on 3s. … C Ian Mahinmi played almost 13 minutes after he had been questionable with a sprained left ankle. Warriors: Key reserve Shaun Livingston was out for personal reasons to attend a funeral. … Rookie Jordan Bell was inactive for the first time as C JaVale McGee became available after sitting out Wednesday against Toronto. ”Some guys are guaranteed minutes every night, some aren’t,” Kerr said of his plans in the season’s early stages. Wizards: At Sacramento on Sunday. Warriors: Host Pistons on Sunday seeking an eighth consecutive home victory in the series.